Who is Interactive Instruments and what do we do? Interactive Instruments is a subchapter S corporation that started in 1993. Initially employing two people in a small 2400 sq. ft. shop. We expanded rapidly in the first years and currently employ over ten full time people in 13,000 square foot of floor space with 6,600 sq. ft of shop floor, 1,600 sq. ft of office and 2,300 sq. ft of system assembly space. Our equipment list has also grown from a single 3-axis CNC machining center and a 4-axis wire EDM along with various manual machines to six 5-axis CNC mill's, two 5-axis trunnion mills, four 4-axis wire EDM's, CNC lathe, 10 ft sheet metal sheer, 8 axis CNC press break, 20 station CNC turret punch and a timesaver wet finish sander. 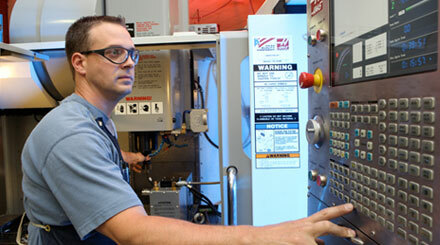 Each CNC unit is linked to our network enabling any CAD workstation to transfer machine code to any CNC machine. Between our machining, sheet metal and welding services, we are a one stop service. Early on we saw the need to invest in the best CAD/CAM software available because computer controlled design and manufacturing is essential in producing complex projects in a timely manor. We invested in Pro/ENGINEER and Pro/MANUFACTURING (advanced 5 axis package and sheet metal design) as our primary CAD of choice. Many of our designs are now modeled in Pro/ENGINEER so we can model and create machine code within the same package. 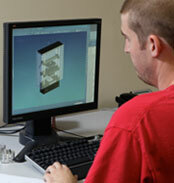 We have three mechanical designers and two sheet metal designers with extensive background in CAD/CAM and CNC machining. 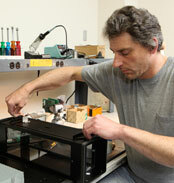 We also have an Electronic Engineer with experience in firmware, hardware and software. Combining the machining and electronic talents gives us a strong position in developing quality electromechanical systems.